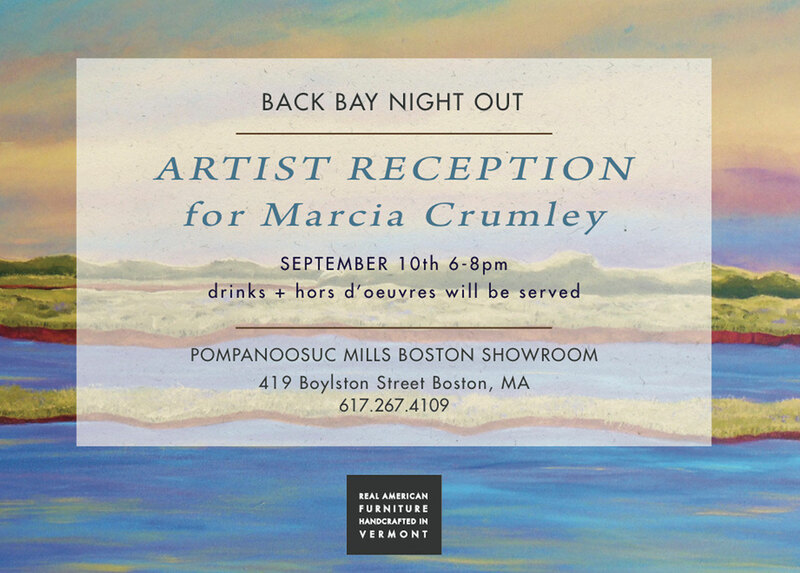 Art Events & Happenings - Website of marciacrumleyart! 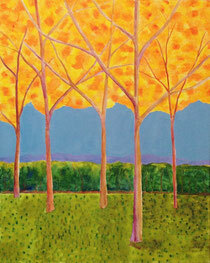 My paintings celebrate nature’s “sacred spaces,” highlighting the natural beauty that adds so much to our lives. I paint unspoiled places, with no human presence, and draw the viewer’s attention to the vital energy that surrounds tree and plant life and that emanates from the water and air. 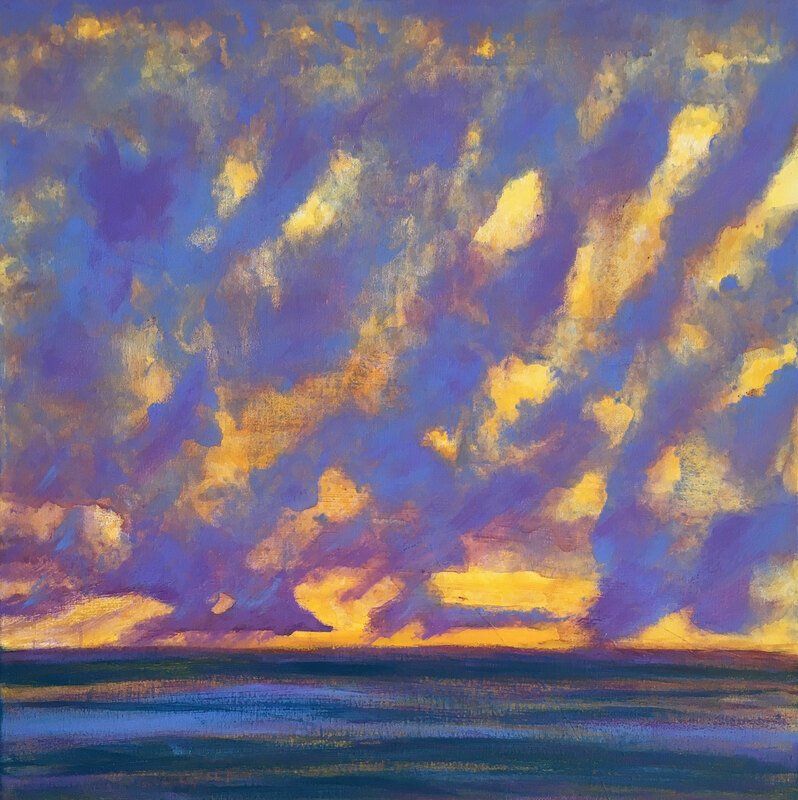 I make this energy palpable by leaving flashes of the contrasting underpainting visible around the edges of trees and horizons, and throughout the sea and sky. The underpainting, typically done in saturated monotones such as magenta, creates a dynamic contrast to the foliage, adding visual depth to my paintings and drawing the eye to these sacred spaces. 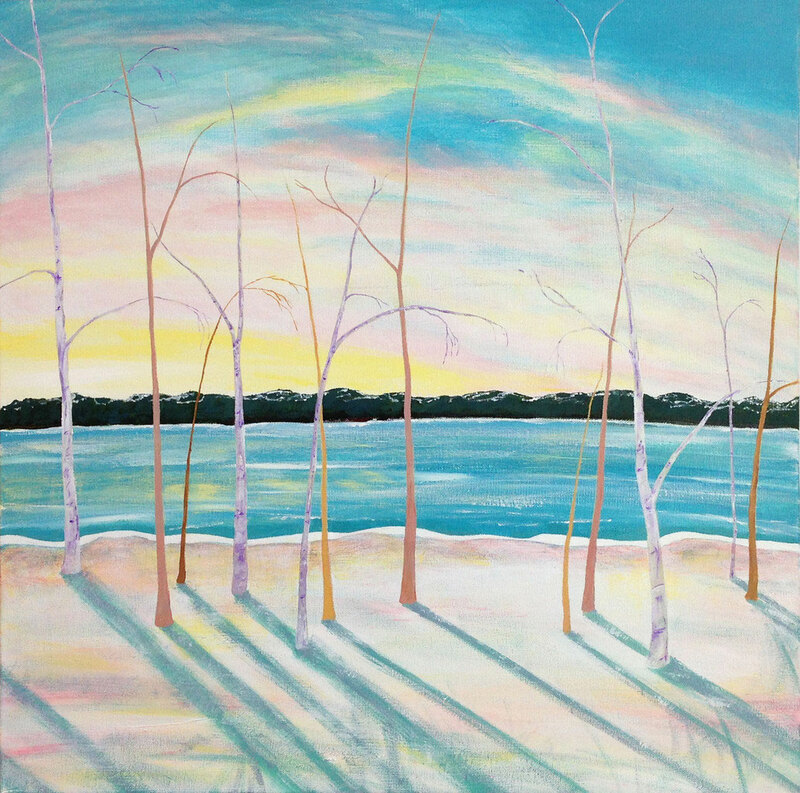 Many of my landscape paintings are inspired by light: how it filters through the tree canopy, or bounces off of the water, or moves across the horizon. 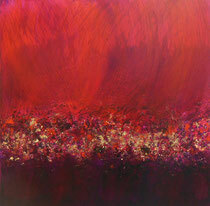 This solo exhibition will showcase many paintings where the play of light is the primary focus. One piece I created specifically for this exhibition is Moondance. There's something simply magical about watching a full moon as it illuminates the night sky and sends light shimmering across the water. This painting was designed to play up that sense of motion and dancing light. While it's a relatively small piece (12" x 12"), it packs a lot of power. 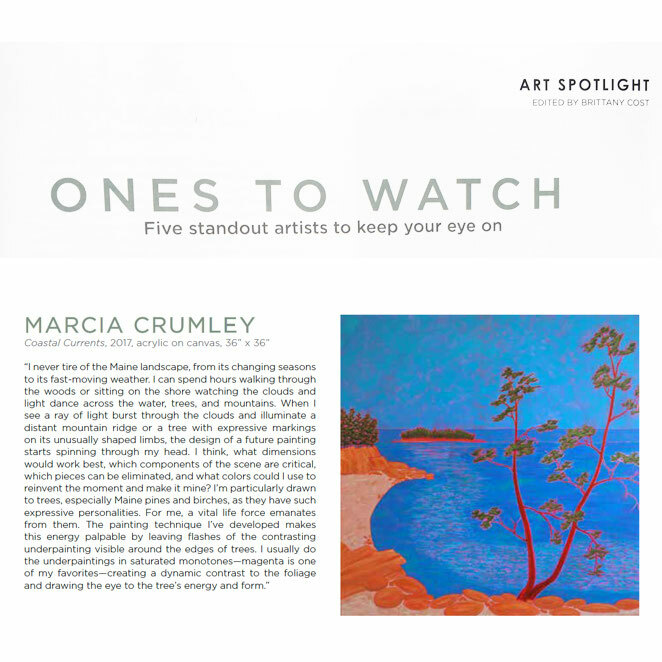 I was named one of "five standout artists to keep your eye on" in the September issue of Maine Home + Design. The painting selected - "Coastal Currents" - will be on display in my studio during South End Open Studios on September 16th ad 17th..The painting is 36" by 36" acrylic on canvas, framed in a maple floater frame. 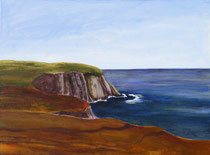 I hope you can stop by and say hello and see my most recent landscapes. There's also going to be a gorgeous handcrafted Pompy end table raffled off to one of the lucky attendees of Sunday's opening!! 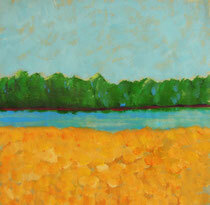 If you can't make the opening, 15 of my landscapes will be on view in the Natick showroom through August 18th. This will be my first time participating in this event, which is one of the largest open studios in greater Boston. Roughly 175 artists will be spread across 50 to 60 pop up exhibition sites. I'll be sharing space in CRG Realty's offices in the Piccadilly Building at 1280 Centre Street, Newton Centre, with 3-4 other artists. Opening reception Friday, March 31st, 5-7 PM; open studio hours Sat & Sun, April 1st and 2nd, from 11am-5pm. Please stop by and say hello! 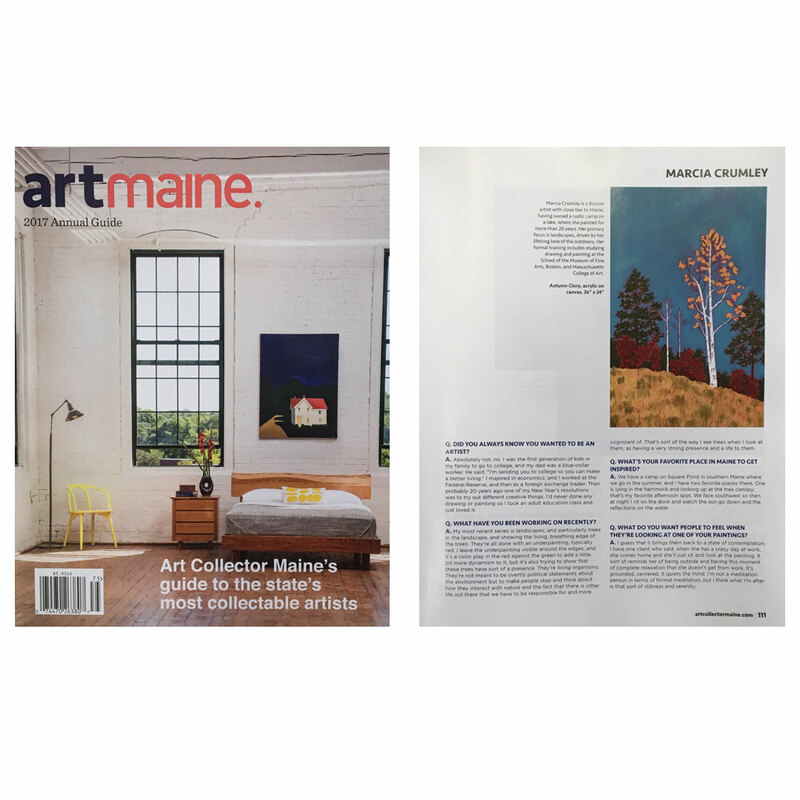 The 2017 annual guide to Maine artists just came out, and I'm thrilled to be included. 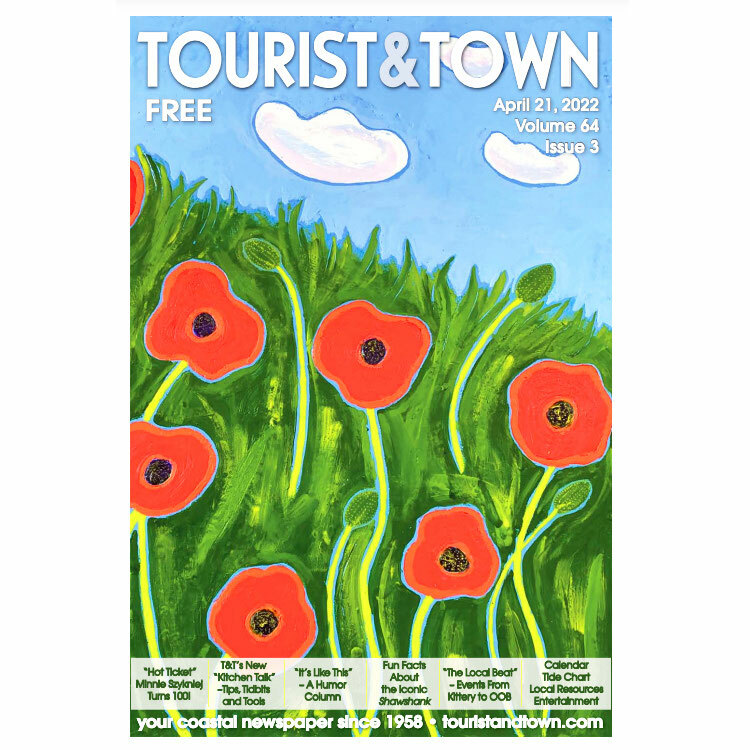 You can pick up a copy at any bookstore in Maine or in the Portland Art Gallery at 154 Middle Street in Portland. I'm on page 111, talking about what inspires me and my latest series of landscapes. Today was the grand opening of the newest East Boston Community Health Center, in Winthrop, which will be providing primary care to local residents. It's in a gorgeous waterfront spot, and to make the center even more welcoming, they selected work from local artists to adorn the walls. 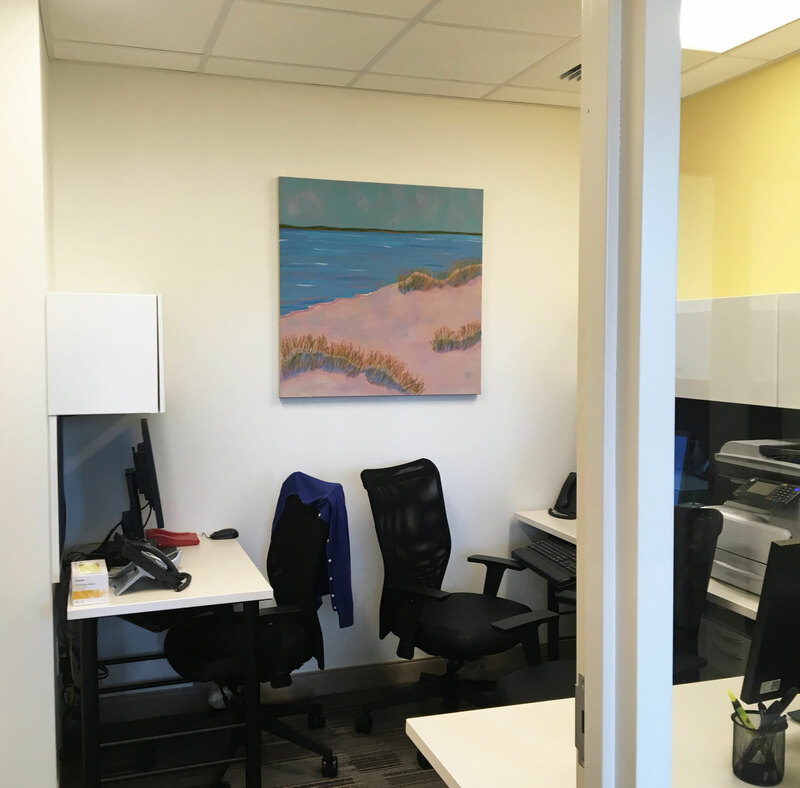 I’m thrilled that my “View from the Dunes” original painting on panel will be welcoming patients to the center. 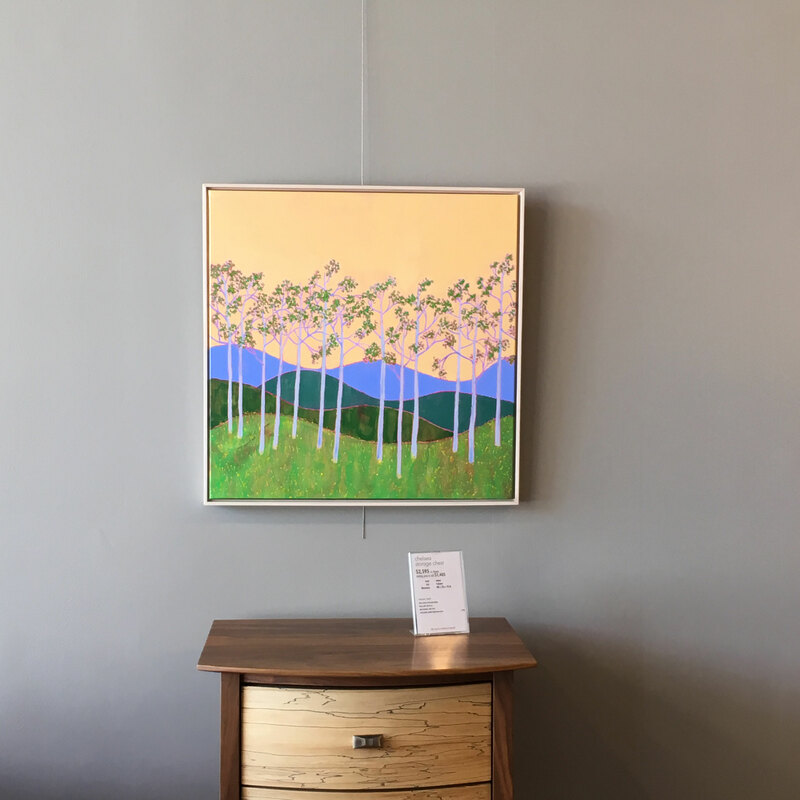 Many thanks to Betty Bothereau and her team for selecting my painting for this wonderful new space!! 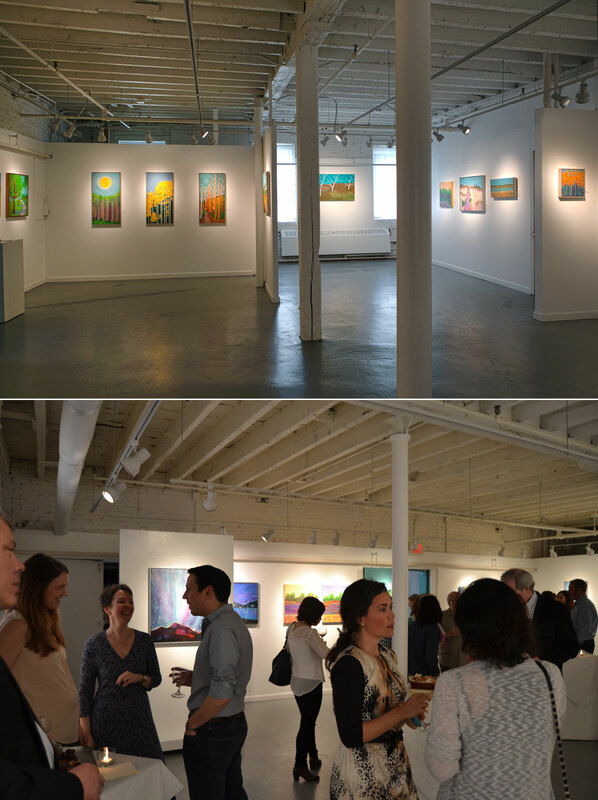 My most recent solo exhibition featured 26 of my colorful, contemporary landscapes. Most were of New England scenes near and dear to my heart, from the beaches of the south coast of Massachusetts where I grew up, to the mountains and lakes of Maine. The opening reception was packed, and was a fun night for all! If you’d like an exclusive invite to my next opening, please visit my contact page and either send me an email or click on the “join my mailing list” link at the bottom of the page. 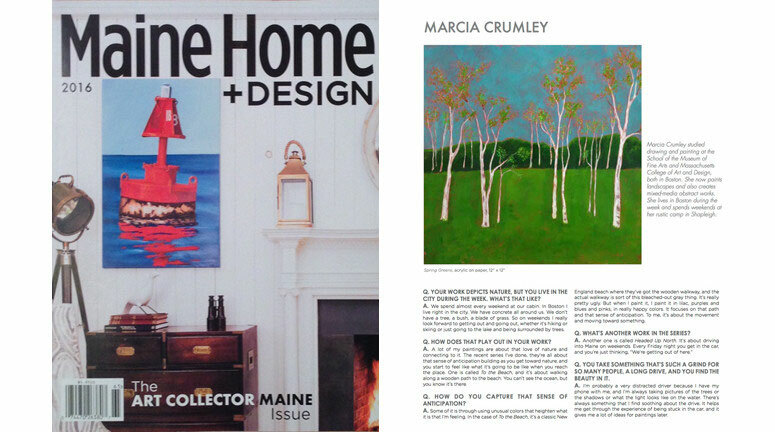 I'm one of two dozen artists with ties to Maine who were selected for profiles in the 2016 Bonus Art Edition of Maine Home + Design. This fall, I visited the Portland, Maine headquarters of the magazine for an interview with Editor at Large Jen DeRose. We spent nearly an hour chatting about sources of artistic inspiration and why paths and journeys play such an important role in many of my paintings. 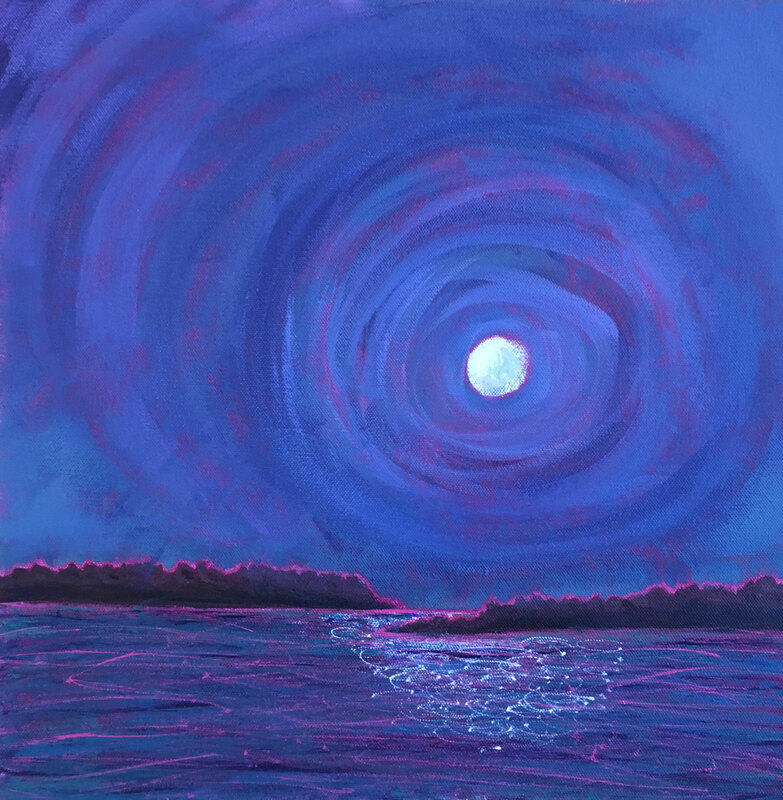 paintings selected for the Back Bay showroom at 419 Boylston Street include landscapes from around New England as well as the latest paintings in my Night Sky series. A dozen of my landscapes will be on view in the downtown Concord, New Hampshire showroom of Pompanoosuc Mills through autumn 2015. 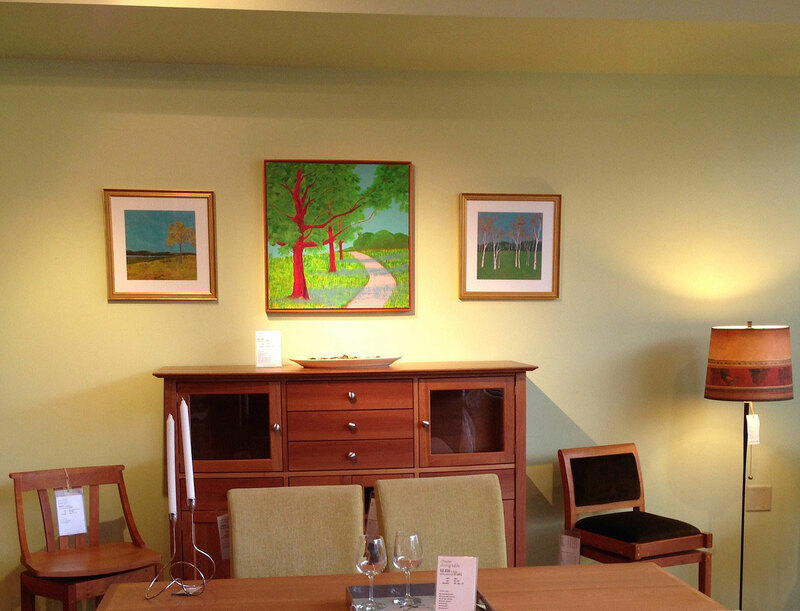 The paintings, chosen to complement the locally designed and handcrafted furniture, are placed in different room settings throughout the store. My work was featured in the Boston Globe’s Style section. My “Pale Winter Sky” painting was one of six works selected by Marni Elyse Katz for her “Artfully Arranged” column on April 6, 2015. Here’s a link to the article. In addition to writing her style columns for the Globe, Marni writes the fabulous design blog stylecarrot.com -- be sure to check it out!! My first New Hampshire exhibition! Two of my abstract paintings were selected for the 29th Annual Omer T. Lassonde Open Juried Exhibition sponsored by the New Hampshire Art Association in Portsmouth, New Hampshire. The juror was Jessica Roscio, Ph.D., Associate Curator Danforth Art Museum and School. The exhibit is open from April 1-29, with the opening reception on Friday, April 3, 2015, from 5 – 8 PM. The exhibit and reception are being held in the Robert Lincoln Levy Gallery at 136 State Street, Portsmouth, NH. Gallery hours are Wednesday through Saturday 10-5, and Sunday 12-4 PM. Best of Houzz 2015! I was named Best of Houzz in the Arts category for 2015, based on client reviews. If you haven’t checked out Houzz.com, you definitely should. It’s one of the most addictive home design/interior decorating sites around. They have daily and weekly features that offer inspirational ideas on remodeling or decorating specific rooms. You can also post photos of a troublesome spot in your home and ask for community input/suggestions. Please check out the site -- and enjoy! 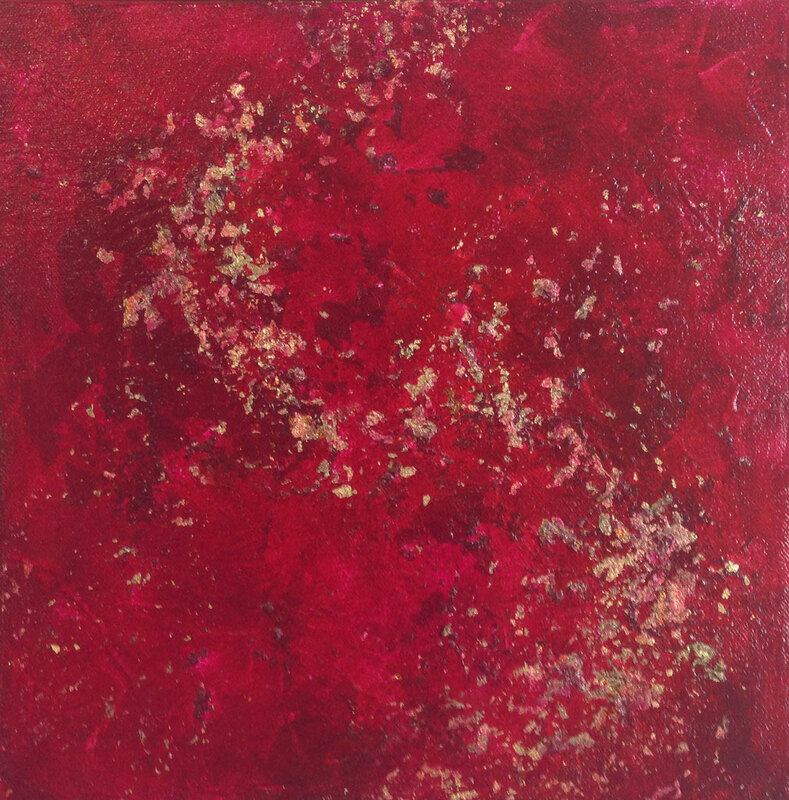 SoWa Open Studios, Sept 20 & 21, 2014 450 Harrison Avenue, Boston, Studio 319. I'll be open both days from 11 am to 6 pm. Every studio in the building is required to open for the weekend, so if you want to experience a wide variety of styles and mediums of art, this is the perfect event. I'll have lots of new works on display, including newly-finished River's Edge, shown at left. My Art to be Featured in a Movie! Five of my pieces were selected by the set decorator of the upcoming Gus Van Sant Movie "Sea of Trees." While there's no guarantee they will all make it into the final cut, or how visible they will be, it's still super exciting to have this opportunity.